Growing up in Timaru, Aston Greathead was a born artist. Even at an early age he enjoyed painting and drawing and soon developed quite a talent. So much so that at one event it was believed that the painting he submitted was not his own. He was sent into a room with a pencil and paper only to amaze the judges by returning shortly later with a magnificent work of art. After leaving school, Greathead served in Egypt and Italy as a soldier through World War 2. While on leave he often had the opportunity to sketch and paint which he frequently did for fellow soldiers wishing to send home pictures. When the war ended, Aston Greathead returned to New Zealand and set up a signwriting business, married and had three children. The business flourished but the stress became too much for him and in 1960 he was advised to give up. As an unlikely solution to the family predicament he sold the family home and moved to their bach in Kaikoura. At the time there was only one motel in the town so with money from the sale of his house he bought a group of fishermans cabins which he let out to travellers. For the next three years the family lived from hand to mouth largely on the earnings from the cabins supplemented by the occasional sale of paintings. By the fourth year sales had picked up and the future began to look considerably brighter. 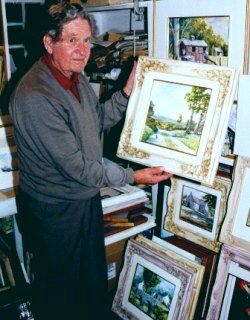 On a regular basis Aston Greathead would travel out into the field to paint. In this way, quite a number of his paintings have captured history which was never photographed. In 1966 after only six years of full time painting he won the Dawson Hallmark award sponsored by Sir Henry Kelliher. Aston Greathead paints largely in oil acrylic which he believes is comparable to straight oils but easier to work with. His actual preference is water colour but recently he has used this less. He never received art lessons and his painting technique is derived greatly from his time as a signwriter. Because of this, he only uses four colours of paint and the colour of the canvas. This enables him to paint very fast, often completing a work in a matter of hours. In recent years he has started making his own sculptured frames which give a three dimensional element to his work. As he continues to work from his Blenheim home which he moved into in 1994, he is adamant he will never retire.